The fabulous Kimberly at Addicted to Costco blog had two important new posts. One is her post on the current coupon book which starts today, May 8, and runs to June 1, 2014. To me, this is a particularly good coupon book, I need the tissues, contacts, and, of course, the frozen fruit bars. Here's her link directly to the coupons. Remember you need the book or the app on your smart phone, don't print these off, facsimiles do not work. Kimberly also has a Costco new locations post. I'm so impressed by these posts and the amount of work she does to figure out all this information. If you're wondering about new locations, Kimberly says there is good news! Please check out her blog. 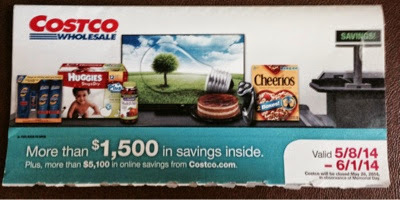 What happened to the addicted to Costco site? Do you know if kimberly is ok?